1908. In the fading twilight of the Old West, Taylon Flynn, a once feared outlaw now forgotten and rendered obsolete by the passage of time, wastes away in virtual anonymity on a decrepit ranch. Unable to reconcile the man he was with the man he has become, he summons an old accomplice for one last ride in a desperate attempt to seek redemption for the error of his ways; a daughter he abandoned, a friend he left for dead, and a wife brutally murdered for his crimes. Determined to extract his revenge with boots on and guns blazing, Taylon’s vengeance ride is quickly derailed by the ruthless boss of a dying mining town and a legendary lawman harboring a dark secret. With his last chance at redemption rapidly escaping, Taylon must confront the inner demons he purged long ago and truly atone for his past sins in order to save his soul and the one thing in life that he truly loves. 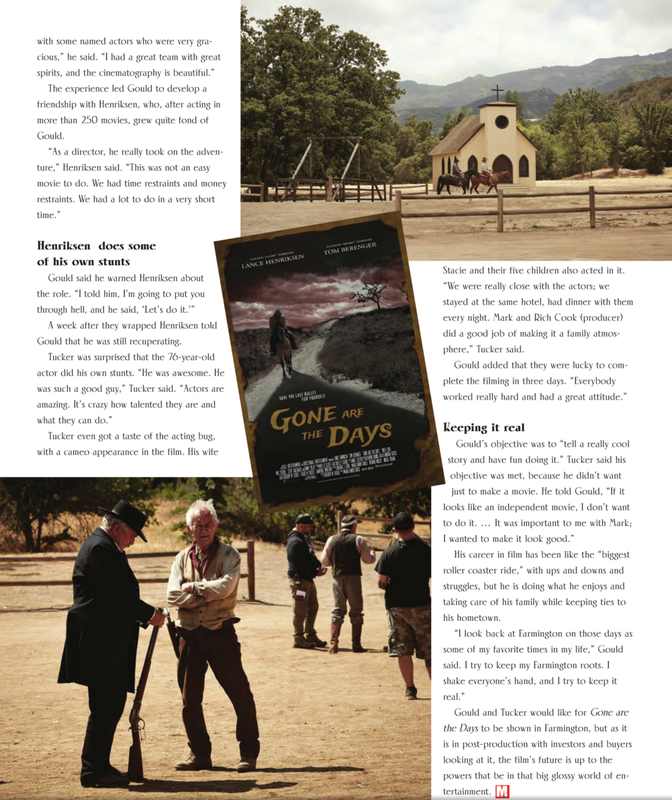 GONE ARE THE DAYS is an unconventional western that lies at the intersection where Unforgiven and Lonesome Dove collide with The Revenant to tell a classic tale of revenge, redemption and love. 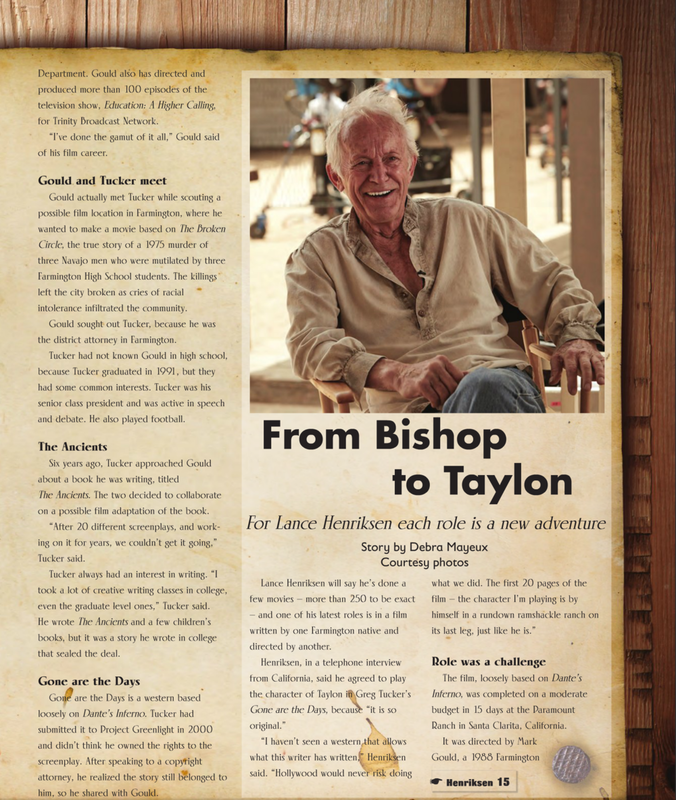 Iconic actor Lance Henriksen has starred in a multitude of films and television projects exemplifying the diversity of his talent. He’s worked with some of the most prominent directors in the motion picture industry, including Steven Spielberg, James Cameron, Sidney Lumet, Jim Jarmush, Kathryn Bigelow, John Woo, Paul W. S. Anderson and Sam Raimi. Recently, Henriksen joined the cast of The Blacklist in the recurring role for NBC. He was in the AMC Miniseries event Into the Badlands and also a recurring role in The Night Shift.Henriksen starred in Dreamworks and TNT’s 12-hour miniseries Into the West, executive produced by Steven Spielberg. He also starred for three seasons on Millennium, Fox-TV’s critically acclaimed series created by Chris Carter (The X-Files). Henriksen’s performance as ‘Frank Black,’ a retired FBI agent who has the ability to get inside the minds of killers, garnered three consecutive Golden Globe nominations for “Best Performance by a Lead Actor in a Drama Series” and a People’s Choice Award nomination for “Favorite New TV Male Star.” He was also nominated for a Golden Satellite Award for his portrayal of Abraham Lincoln in the TNT original film The Day Lincoln Was Shot. Born in Chicago, Oscar nominee, Golden Globe and Emmy winner Tom Berenger was raised in a working class home as the son of a printer for the Chicago Sun-Times. Tom attended the University of Missouri to study journalism. It was there he first auditioned for a role in “Who’s Afraid of Virginia Woolf” at the college theater on a whim and a bet with a roommate. He was accepted for the role of “Nick.” After several stints in regional theater, Tom then attended the Herbert Berghof Studio School for Acting in New York City. While in New York, he pursued his professional career in theater and television. Tom’s auspicious film debut in Looking for Mr. Goodbar (1977) led to other roles in films such as Eddie and the Cruisers (1983), The Big Chill(1983), Platoon (1986), Someone to Watch Over Me (1987), Shoot to Kill (1988), Last Rites (1988), Major League(1989), Shattered (1991), Gettysburg (1993), The Substitute (1996), Sniper (1993), RoughRiders (1997), Inception (2010), Hatfields & McCoys (2012), among many others. Danny Trejo was born Dan Trejo in Echo Park, Los Angeles, to Alice (Rivera) and Dan Trejo, a construction worker. A child drug addict and criminal, Trejo was in and out of jail for 11 years. While serving time in San Quentin, he won the lightweight and welterweight boxing titles. Imprisoned for armed robbery and drug offenses, he successfully completed a 12-step rehabilitation program that changed his life. While speaking at a Cocaine Anonymous meeting in 1985, Trejo met a young man who later called him for support. Trejo went to meet him at what turned out to be the set of Runaway Train (1985). Trejo was immediately offered a role as a convict extra, probably because of his tough tattooed appearance. Also on the set was a screenwriter who did time with Trejo in San Quentin. Remembering Trejo's boxing skills, the screenwriter offered him $320 per day to train the actors for a boxing match. Director Andrey Konchalovskiy saw Trejo training Eric Roberts and immediately offered him a featured role as Roberts' opponent in the film. Trejo has subsequently appeared in many other films, usually as a tough criminal or villain.